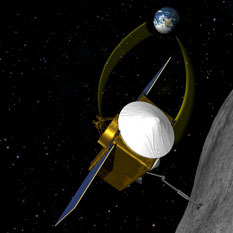 OSIRIS-REx is going to fly to an asteroid and bring back some pieces. Right now, the asteroid's name is 1999 RQ36, but we think students can do better! The Planetary Society, MIT's Lincoln Laboratory, and the University of Arizona are asking students around the world to suggest better names for the asteroid. Enter by December 2, 2012 to have a chance to name a piece of the solar system! The contest is open to kids under the age of 18. To enter, parents or teachers must fill out an online entry form with the proposed name and a short explanation of why that name is a good choice. Asteroids can't be named just anything, of course. The International Astronomical Union governs the naming of big and small objects in the solar system, and they have guidelines on how to name near-Earth objects like 1999 RQ36. Sources: NASA, The Planetary Society.